Photographed Oct 2013 waiting on inflorescences of Desert Broom (Baccharis sarothroides), along Sycamore Creek, Mazatzal Mts., Maricopa Co., Arizona. Oct. 2013. The bug is colored to resemble an unopened head of this composite flower (lower left). 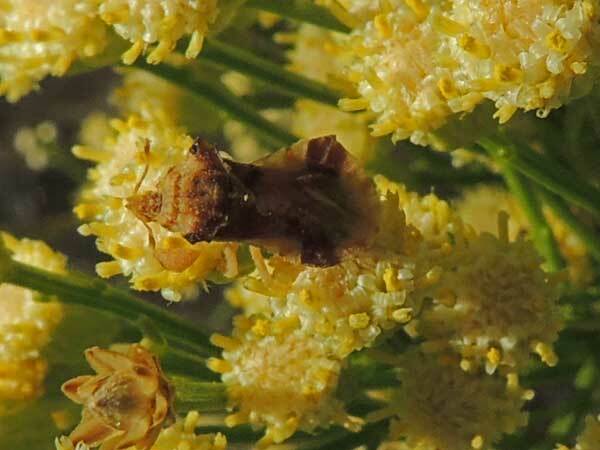 Ambush Bugs are classic sit-and-wait predators. Their color and shape allow them to hide among flowers, virtually invisible to pollinators coming to visit for nectar or pollen. If a bee or butterfly comes withing striking distance the bug grabs the unsuspecting insect and immediately delivers a toxic bite through its piercing-sucking mouthparts. With strong fore-legs they can hold and prevent escape of surprisingly large bugs until the venom takes effect. Curious humans should handle these insects with caution, because they might bite the hand in defense. Copyright Michael J. Plagens, page created 14 May 2014.